More than 550 marijuana plants were confiscated by the Cannon County's Sheriff Department from a red mini-barn Saturday, April 13 on McMinnville Highway. 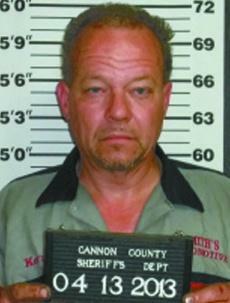 Arrested was Kerry Shane Smith, owner of Smith's Automotive. Smith was charged with manufacture of marijuana, possession with intent to resale, possession of drug paraphernalia and maintaining a dwelling. A court date was set for June 4 in General Sessions Court. Sheriff's officers executed two search warrants in the case. One was served at Smith's rental home and a second at his business on McMinnville Highway. Investigator Brandon Gullett discovered green, leafy plants at the home where Smith had been living that were believed to be marijuana. "I then located and removed 552 marijuana plants inside the red mini- barn located on the property," Gullett reported. "The plants were in all different stages of growth from just sprouted to full grown," Gullett said. The little barn was equipped as a grow lab and featured a ventilation system complete with fan and "grow lights." "I then logged and photographed the potting soil, black pots, fertilizer, water buckets, clone solution, plant food, plant shears, ventilation system, fan, grow lights, electric wire, power converters, plastic containers and three kids' swimming pools," Gullett said. The sheriff's department also seized a 2000 gold Cadillac Deville that was registered to Smith. Additional drug-related items were discovered in the basement of the house including a large plastic bag containing leafy, green plant material believed to be marijuana. Inside the drawers of a TV stand were discovered gallon-sized plastic bags and a set of digital scales that were also photographed and logged as evidence. Gullett then, along with Sheriff Darrell Young, Investigator Anthony Young and Deputy Jordan McGee executed a search warrant at Smith's business at 7607 and 7621 McMinnville Highway. An empty grow room was discovered above the office inside Smith's Automotive, Gullett said. Empty black pots were found as well. In a drawer in Smith's office were several synthetic urine kits commonly used to falsify drug tests. nice supplemental income I would say! !